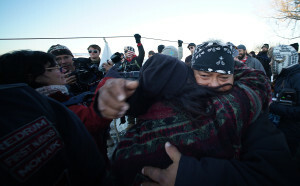 CANNON BALL, N.D. — On a blustery day when new snow blanketed the hard prairies of the Standing Rock Sioux Reservation, U.S. Rep. Tulsi Gabbard boarded a plane to Washington, D.C., where she was scheduled to vote on bills related to pay for injured veterans and investment rules for small businesses. 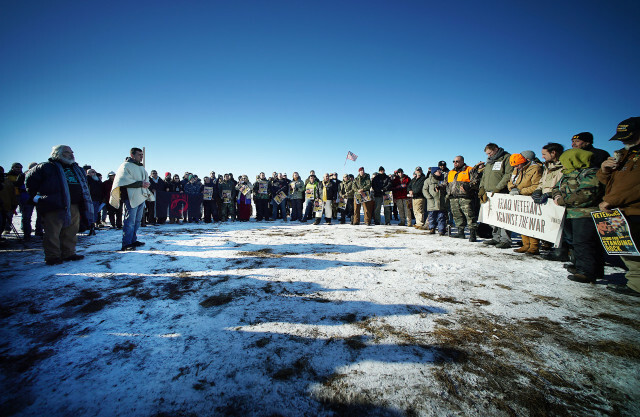 By most accounts, Gabbard’s visit to North Dakota had been a success. 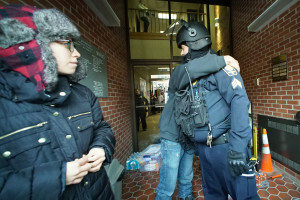 The Hawaii congresswoman arrived Saturday as part of a contingent of military veterans who vowed to act as human shields for protesters fighting the Dakota Access Pipeline because it threatened the reservation’s water supply. Her timing was immaculate because on Sunday the U.S. Army Corps of Engineers announced it would halt the project while alternative routes are considered. 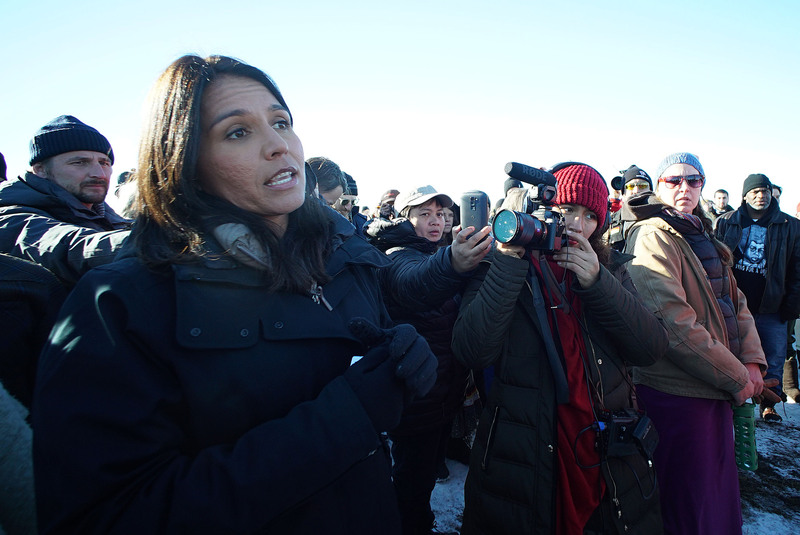 The one blemish came during an event in a field about two miles from the Standing Rock protest camp as Gabbard addressed dozens of veterans about the importance of fighting for the tribe’s cultural rights and access to clean water. U.S. Rep. Tulsi Gabbard answers a question from a crowd of military veterans during her visit to the Standing Rock Sioux Reservation. As she finished, a Native American veteran called out from the crowd. 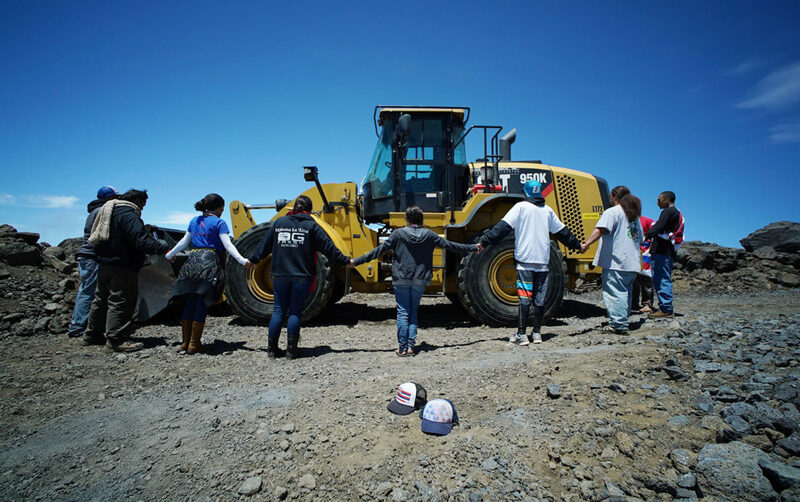 He wanted her to address an indigenous struggle that has been playing out in her own backyard — the proposed construction of the Thirty Meter Telescope atop Mauna Kea, the state’s tallest mountain and a place some Native Hawaiians consider sacred. 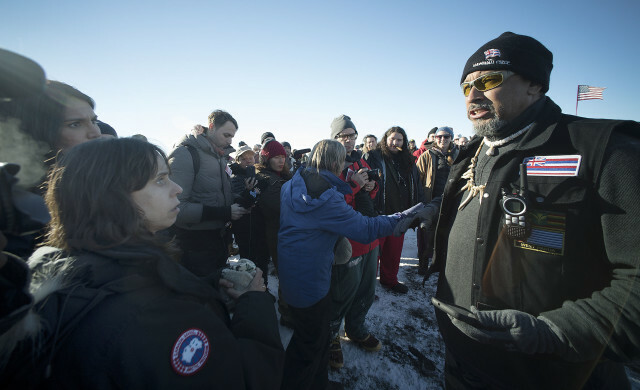 Gabbard had not yet taken a public stance on the TMT. But in that moment she was put on the spot. Her response didn’t please a Native Hawaiian in the audience who has emerged as a prominent figure in the Standing Rock protest. 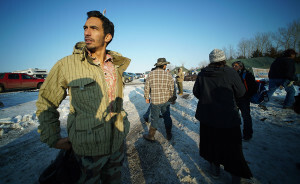 Native Hawaiian activist Andre Perez, seen here at a veterans rally, has been training protesters in North Dakota in the art of peaceful resistance. Gabbard agreed with Perez. But she also noted that the TMT International Observatory Board of Governors is seeking a backup location outside of the U.S. In October, the board announced the Canary Islands of Spain would be the alternative site should Hawaii decide not to issue permits for the project. 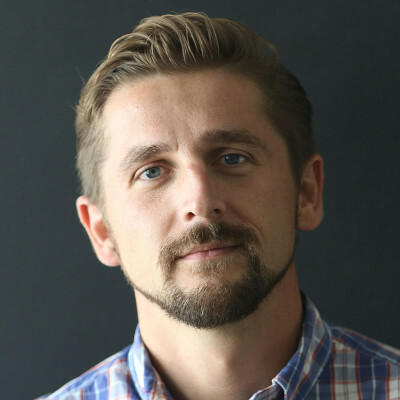 Perez told Civil Beat after his encounter with Gabbard that it was important to confront the congresswoman, especially during such a high-profile event that was being covered by many media outlets. Veterans gathered at a rally in support of the Standing Rock Sioux as the tribe fought to block the Dakota Access Pipeline. Gabbard has been an outspoken opponent of the Dakota Access Pipeline in recent weeks, saying that the project threatens the drinking water of the Standing Rock Sioux and did not fully consider the impacts to culturally sensitive sites. On Thursday, she took the floor of the U.S. House of Representatives to urge President Barack Obama to halt construction of the pipeline. Gabbard responded to Perez’s comments while walking to her car after the veterans event. 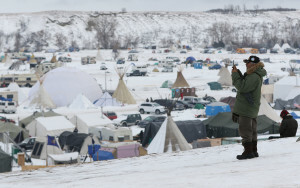 Her next stop was the Oceti Sakowin Camp, where many of the Standing Rock protesters had pitched tents and teepees to settle in to block the pipeline. The congresswoman told Civil Beat that she’s aware of the concerns of those who protested on Mauna Kea, and that she wanted to bring that insight with her when she came to the Standing Rock Sioux Reservation. But she also said she wanted to understand how the protesters here might help her address the concerns of Native Hawaiians in the islands. She acknowledged that she misspoke when addressing the veterans. In 2015, protesters at Mauna Kea were successful in delaying a giant telescope from being built. Gabbard said she would do what she could to ensure that Hawaiian voices are heard. Ever since U.S. Sen. Dan Akaka retired in 2012, no new member of Hawaii’s federal delegation has been of Native Hawaiian descent. Recent studies suggest there are more than a half-million people in the U.S. who identify as Native Hawaiian, although many of them are of mixed ethnicities. Nearly 300,000 of them live in Hawaii — about 21 percent of the state’s population of about 1.4 million. On Monday night, Gabbard clarified her position on the TMT. In a statement, she reflected on her first visit to Mauna Kea as a child, saying it was an uplifting and enlightening experience for her, even though she was alarmed at all the buildings, many of them telescopes, that had already been constructed there. She noted not all Native Hawaiians oppose the project. 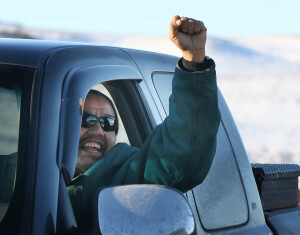 In fact, there are some who passionately support building it despite the concerns of protesters. She said both sides should be heard. “As we discuss the use of crown land, our responsibility is to ensure that the process is open, transparent, and embraced by our Native Hawaiian community,” she stated.